Seven years ago, James Young lost his left arm after falling in between two train carriages. A recent contest held by Konami, a company primarily known for creating video games has allowed James to replace his limb with an extremely high-tech prosthesis. Applicants needed to be passionate about video games and live in the UK. James was chosen out of over 60 applicants to receive the prosthesis. The arm was inspired by the video game Metal Gear Solid V: The Phantom Pain. The main character in the game, Snake, awakes from a coma to learn that his shattered left arm is to be replaced with a synthetic limb capable of detecting minute vibrations, unleashing bolts of electricity, and punching out adversaries. Although the game is set in 1984, the alternate timeline results in many technological developments such as the prosthesis that Snake uses. The new prosthesis not only provided James with increased dexterity over his previous one, but also features many gadgets not seen traditionally. The arm features a torch, a laser, banks of LED lights that can display different colors or synched with Mr. Young’s heartbeat. There is a USB port in the wrist for charging phones or uploading data to a display panel, and a mount for a miniature quadcopter, a tiny drone, that can be controlled using one hand from a panel mounted on the forearm. 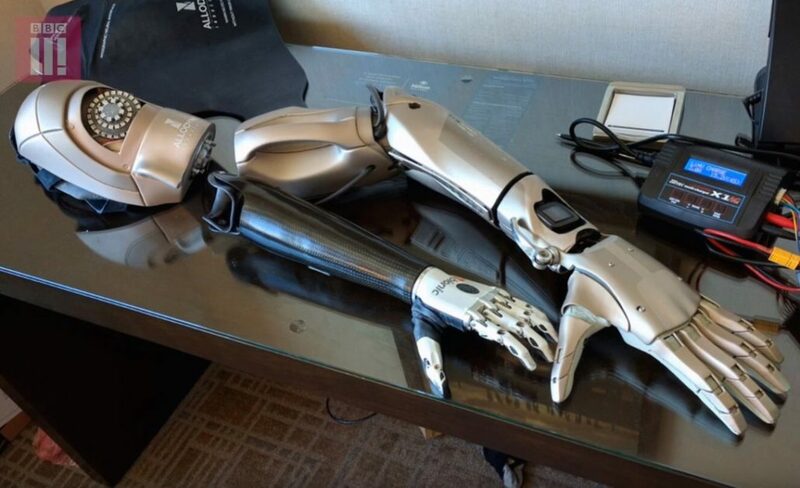 With all of the gadgets and upgrades, the prosthesis cost nearly $80,000 to produce.